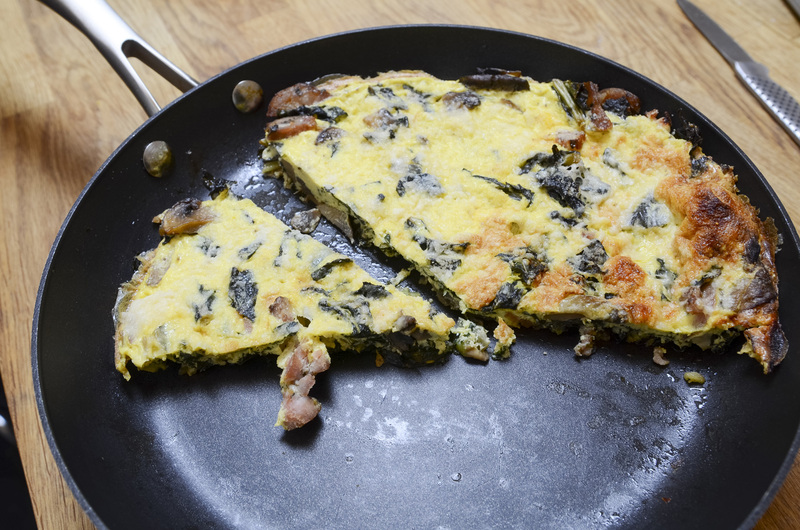 We had so much kale and almost one whole sausage left from dinner, so I let a couple of days go by and then reconstituted the mix in a dinner time frittata. Had just enough mushroom-barley soup in the freezer to make a little first course and then the frittata and a salad made the complete meal. All I did was chop the kale and sausage and sautéed it a bit in some olive oil. I beat 4 eggs with a drop of milk and salt and pepper and poured the eggs over the hot leftovers. I sprinkled the top with Parmesan cheese and popped the pan in a preheated 400ºF oven for about 12 minutes. Served it straight from the pan on the table. Altogether it couldn’t have been a more satisfying winter meal. Of course, we had just a taste of Sauvignon Blanc with it! It’s odd that when I think of my mom I don’t think of her as the “Nana” she was at the end of her life, but as a vital, aggressive, and, in her own way, nurturing “Mom” of my childhood. As I was making a waffle treat for our breakfast this cold January morning I was suddenly overtaken by nostalgia – partly because the Christmas holidays were my mom’s favorite time of the year and it was during this period that she taught me so much about baking and sharing. And partly because I still make the waffle recipe she taught me. And partly because I have the same “sweet tooth” that she had and love a waffle oozing with maple syrup. But mostly it is at this time of the year that I deeply miss her by my side in the kitchen. P.S. 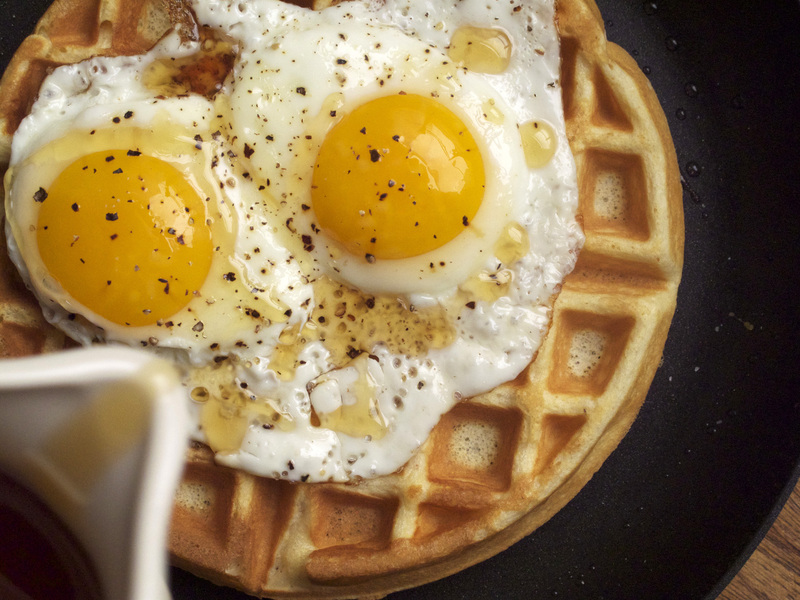 A version of the waffle recipe can be found in the below link entitled “Waffles for Dinner?” from January 2011. Not much to say except “yum, yum, yum”. 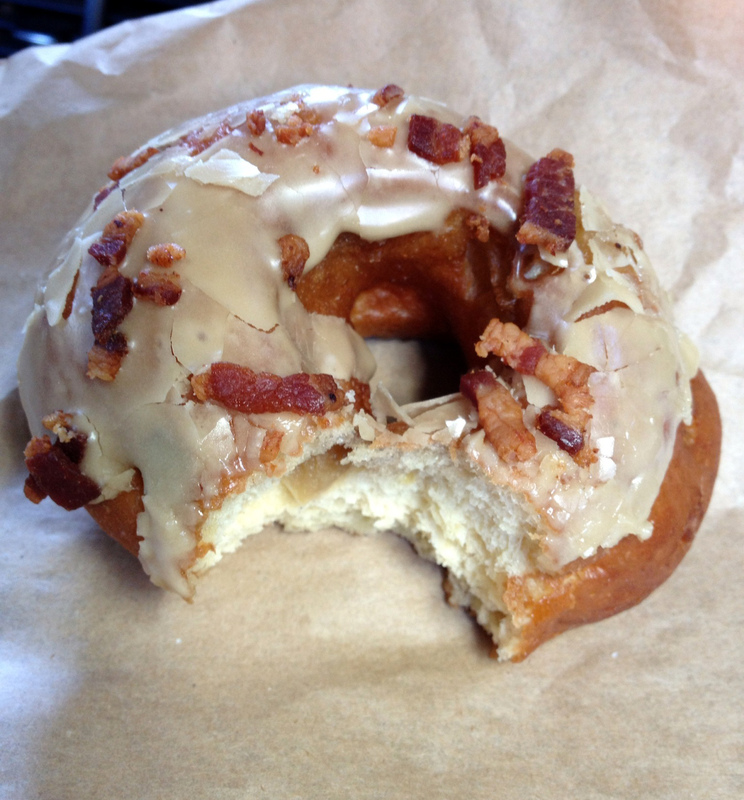 Whenever we are in San Francisco, we always make a stop at Dynamo Donuts (www.dynamodonut.com) for just a bite of their famous Maple Bacon Donut. I can’t say that donuts are my favorite treat, but they sure work for my lovely husband. I have never made those light and fluffy raised donuts, but I do, from time to time, make my mom’s old fashioned ones. I’m thinking I might just make up a batch and coat them with some maple frosting and then sprinkle some salty, crisp bacon bits on top. If you want to try this version, here is mom’s recipe (which can also be found in my out-of-print book, Homemade). I would imagine that the maple frosting is simply confectioners’ sugar, maple flavoring, and a bit of milk or maybe even black coffee to moisten. Sift the flour, baking powder, salt, and nutmeg together. Set aside. Combine the sugar and butter in the bowl of a standing electric mixer fitted with the paddle and beat until crumbly. Add the eggs, one at a time, and beat thoroughly. Then, add the milk. Slowly add the dry ingredients and beat on low until all added and a smooth dough has formed. Using Wondra flour, lightly flour a clean, flat surface. Scrape the dough onto the floured surface and lightly sprinkle the top with Wondra. Pat the dough out to about ⅝-inch thickness. (If the dough seems very sticky, slowly knead in no more than ½ cup all-purpose flour into it.) Using a donut cutter, cut out circles, separately reserving the holes. If using, place the cinnamon-sugar or confectioners’ sugar in a resealable plastic bag. Set aside. Fill a heavy-duty skillet at least 3-inches deep with the vegetable oil. The oil should be deep enough that the donuts can easily float. Place over medium-high and bring the oil to 360ºF on a candy thermometer. Place the donuts, a few at a time, into the hot oil and fry, turning once, for about 5 minutes or until perfectly golden, slightly raised, and cooked through. Lower the temperature if they cook and darken too quickly. Using a slotted spoon, move the donuts to a triple layer of paper towel to drain for just a minute. Quickly transfer the hot donuts to the sugar in the bag and shake to thoroughly coat. Remove the sugar-coated donuts from the bag and place on wire racks to cool slightly. Best eaten while still warm. If you decide to frost them, cool first, and then frost and decorate in whatever manner you choose. Pizza making can be a big, big job and it is one that I enjoy. 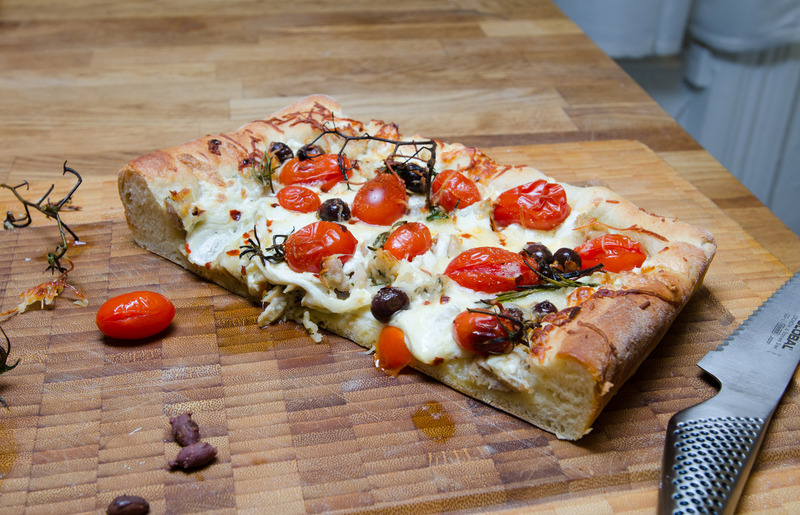 However, I got to thinking that there must be other ways to gather together all of the things that make pizza great without making the dough and the sauce and then deciding on the fixins’. If you feel the same here’s what you do. And, if you’d like to turn it into a breakfast or brunch dish, crack as many eggs as you have diners – but no more than 4 – on top along with some slices of prosciutto or ham nestled into the cheese (in this instance, gruyère can replace the mozzarella). Eh, voila! Combine the flour, sugar, and salt in a mixing bowl. Add the yeast, stirring to blend in. Combine the water with 2 teaspoons of the olive oil. Pour the water mixture into the flour mixture, beating to combine. When blended scrape the dough onto a lightly floured surface and knead with your hands for about 5 minutes or until smooth and elastic. Oil a large bowl and place the dough into it. Cover and let rest for 20 minutes. Line an 8-inch square baking pan with parchment paper, allowing the paper to cover the sides. Set aside. Lightly flour a clean, flat work surface. Scrape the dough out onto the floured surface and, using a rolling pin, roll it out to about a 9-inch square. Lift the dough up and fit it into the paper-lined pan, taking care to push the dough up against all sides of the pan. Sprinkle the top with the mozzarella. (If using eggs and ham, use only half of the cheese, then break the eggs on top and nestle in the ham, finish with the remaining cheese.) Lay the tomatoes randomly across the cheese. Place the olives into the cheese and sprinkle the rosemary and chili flakes over the top. Drizzle olive oil over the top and then generously top with grated parmesan. 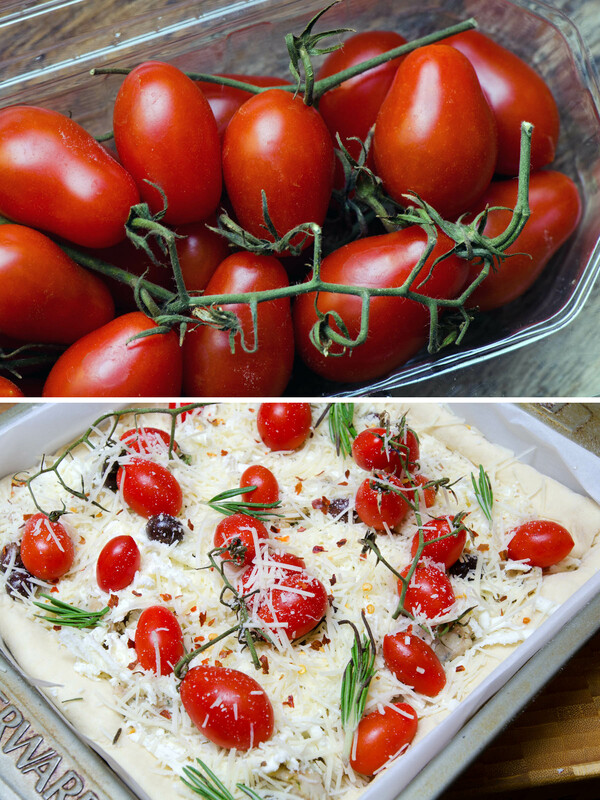 Transfer to in the preheated oven and bake for about 15 minutes or until the cheese is melted and bubbly, the tomatoes slightly charred, and the dough golden brown. Remove from the oven and let rest for about 5 minutes before cutting into squares. 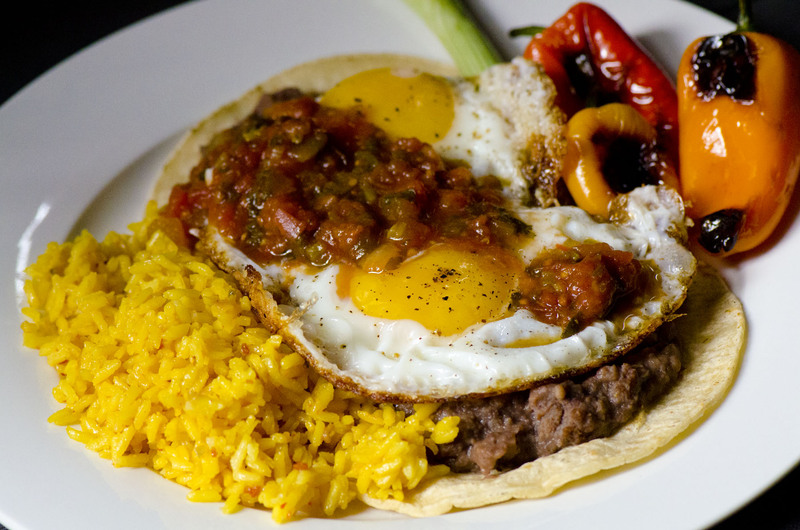 As you can tell, lately I’ve been on a Mexican food kick – burritos one night, mole the next, and then for breakfast a big plate of beans and eggs in the form of huevos rancheros. As much as I love pico de gallo (the ubiquitous dip served with chips in every authentic or wanna-be Mexican or Tex-Mex restaurant), it is impossible to make at this time of the year ‘cause the tomatoes are so anemic and tasteless, so I try to make my own “authentic” Mexican cooked sauces to keep on hand when I need a south of the border fix. To make the huevos, griddle up some corn tortillas (one for each serving and a couple for dipping and cleaning the plate). Top with refried beans, then with 2 fried eggs, sunny-side-up, drizzle with tomato sauce, and serve as is or with a side of yellow rice. On this morning, I grilled some of those sweet little peppers that come, pre-bagged, in a colorful mix that I found languishing in the back of the fridge to accent the plate as we were having friends join us. Place the tomatoes, chiles, and garlic in a stovetop grill pan over medium heat. Grill, turning occasionally, for about 15 minutes or until nicely charred and soft to the touch. You might have to step away from the stove from time to time as the fumes from the cooking chiles can be powerful. Remove from the grill and set aside until cool enough to handle. When cool enough to handle, core the tomatoes, stem the chiles, and push the skin from the garlic. 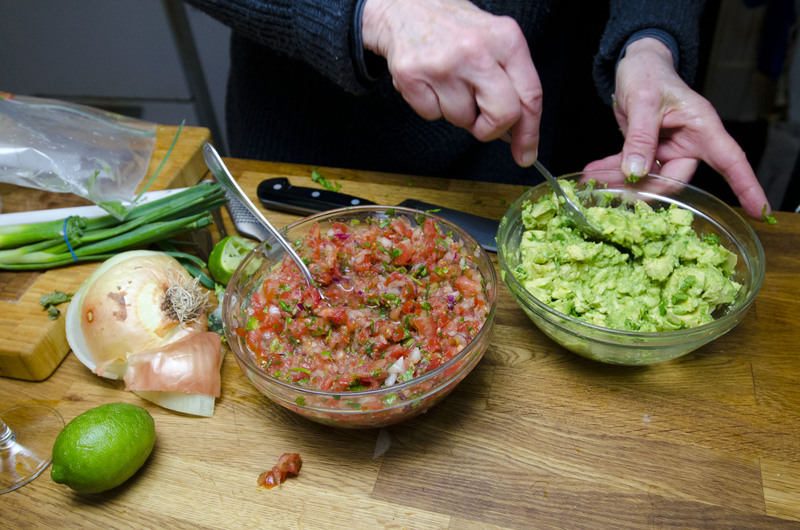 Combine the tomatoes, chiles, and garlic in a food processor fitted with the metal blade. Add the cilantro or epazote and season with salt. Process, using quick on and off turns, to make a chunky sauce. Scrape the sauce into a clean saucepan and place over medium heat. Cook for about 5 minutes just to allow flavors to blend. Taste and, if necessary, add more cilantro and salt. Serve or transfer to a container and store, covered and refrigerated, for up to a week or so. Heat the fat in a large frying pan over medium heat. Add the drained beans along with the garlic, herbs, and chile. Cook, pushing down on the beans with a heatproof spatula or wooden spoon, until all of the beans have been mashed into the fat. Lower the heat and season with salt. Continue to cook, stirring frequently and adding reserved bean cooking liquid to keep the mixture moist, but not runny, for about 20 minutes or until the flavors are well blended and the mix is very flavorful. Serve immediately or store, covered and refrigerated, for up to 1 week. The other morning brought a classic down-home breakfast – Sunnyside-up eggs, bacon from Oscar’s Smokehouse (www.oscarssmokedmeats.com), and a big mess o’ grits. I can bypass the first two, but I do love grits. I made so many that I packed the leftovers in a loaf pan thinking I might fry some in butter for the next day’s breakfast (of course, covered with maple syrup). 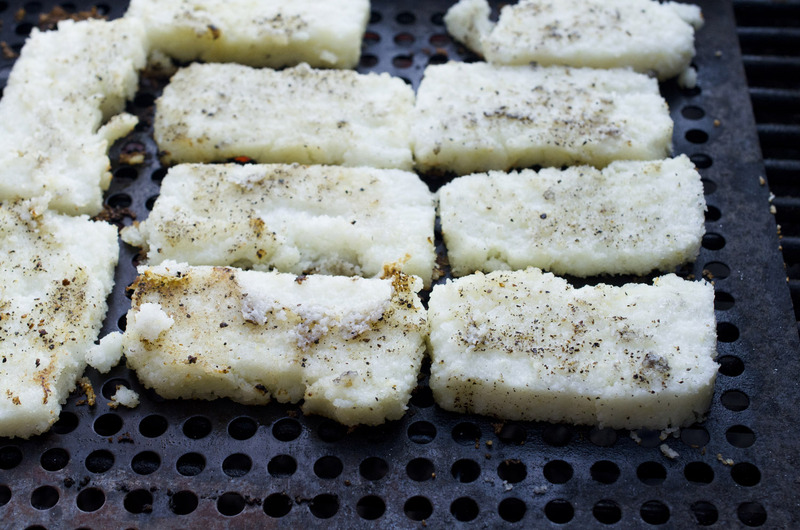 That didn’t happen ‘cause I got an inspiration – sliced the grits and coated the slices well with extra virgin olive oil and salt and pepper and put them on the grill. Meanwhile, back at the stove, I sautéed some asparagus (fresh from the ground) with some ramps, added a little chicken stock, lemon zest, and butter and when the grits came off the grill, I spooned some of the asparagus sauté over the top. Let me tell you, we were all still talking about the dish the next day. I am going to work on perfecting it through the summer and will keep you posted on my progress.